This interactive service is designed especially for families with young children who are sure to be filled with wiggles and excitement. Dress your child in their Christmas finery or their Christmas pajamas – whichever will be more fun – and come join the celebration. Cookies and apple cider will be offered during a simple fellowship time immediately following the 4:30 service. 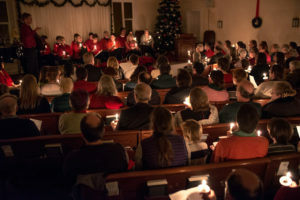 Created with families with school aged children in mind, this service of lessons and carols features the beautiful music of the Unitarian Universalist Church of Kent Peace Choir and Tone Chimers as well as uplifting story, candlelight and a chance to reflect on the meaning of Christmas. Nursery care for infants and toddlers will be offered only at this service. A Christmas Eve coffee hour will be held between the 6:30 and 8:30 services. Created with adults and older teens in mind, this service of lessons and carols also features the beautiful music of the Unitarian Universalist Church of Kent Peace Choir and Tone Chimers as well as inspiring poetry, candlelight and a chance to reflect on the meaning of Christmas. No podcast will be available for this service.